Would you like to: make some new friends? talk about fashion? nosh on great food? laugh until your stomach hurts? Why not join us at the 2015 40+ Blogger meet-up happening July 24-26th 2015 in Vancouver BC. We are hoping to make this blogger meetup the most fun & stylish gathering of 40+ women this CITY, nay, this COUNTRY, has EVER seen! Want to get to know a bit about who will be attending? I am Dutch, born in 1954. Married and living with man, dog and cat. Pretty stepdaughter lives on her own. My full time job leaves me little time to blog. Alas. My main goal with No Fear of Fashion is to entertain, to make people laugh. And yes, it is mainly about shopping and outfits, but there is also something to smile or laugh about. I am a middle-aged tween acting out the growing pains of aging in Vancouver, Canada. My blog, Bag and a Beret, is a show-and-tell of what I wear, what I think, and what the hell. My ‘tude is sometimes portrayed in my alter ego Miz Bagg, a biatch’s best friend, and in photos of my journal sketches of Turnip Head and kitties wearing my outfits of the day. Hi I’m Sheila of Ephemera! I’m a late-40s West Coast Canadian who’s been on the blogging scene since 2008. I focus on Second-Hand First shopping, or purchasing from ethically-conscious companies (have you seen my Fluevog shoe collection? ), and I post pretty much everything I wear. I love the community that fashionable bloggers have created; it’s supportive, friendly and non-snarky, and is full of awesome people! I am so excited to be a part of the July 2015 40+ Blogger Meet-Up! I share pictures and thoughts on my clothing, my art and my writing and other random things; there is no real theme to my blog. If asked to briefly introduce myself I am usually at a loss because either everything seems significant or nothing does. I suppose this makes sense as in person I am either quite verbose or very quiet. I’m looking forward to meeting so many other bloggers at the 40+ meet up! I find trying to describe my personality almost unbearably difficult. Let’s blame cultural differences on that; small talk is not my strongest point… I like talking to people, but only if they talk to me first (because I’m a Finn and we’re a bit socially awkward), and I do know what political correctness is but only apply it during business hours. Elegance Revisited is about living out of a suitcase -as in living in two countries- mixing and matching a very limited wardrobe, and being a bad tourist, with an occasional rant about this or that thrown into the mix. And when I‘m in the mood, I pretend to be some sort of an amateur artist and post something on my online gallery ‘the Dilettante Artist’s Gallery’. The photo is me in my Happy Place : knitting and reading at the same time. With a glass of white wine close to hand, of course. I’m certainly no fashionista but I learned how to sew quite young and I’ve been making up for years of school uniforms ever since. What I’m not so fond of is posing and personal photography so you don’t see much of that on my blog so my lovely assistant…er, dress form, Debbie Double, often stands in for me. I drape her in my latest makes: knitwear, dyed or woven scarves and sewn garments. And yes, sometimes I babble about gardening and anything else I find of interest in my little corner of the world. Anne M Bray (AKA SpyGirl) percolates with creative spirit. She features a weekly closet remix challenge called “52 Pick-me-up” with a list of unusual prompts. She has been known to sketch fellow fashion bloggers, an activity that has been dubbed “getting SpyGirled”. You just might be next! 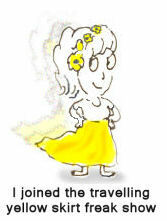 I am a recently retired (from the office only, not from life), about-to-turn 60 woman. Although I have reached this advanced age, I still love fashion and style, music, bike rides, my fabulous husband and my cats. Maybe cats first. 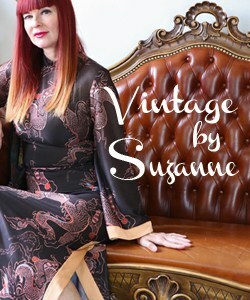 My blog is Not Dead Yet Style, for women who want to look beautiful and authentic in our middle years. I’m a happy, healthy and very blessed 52 year old mother, grandmother, wife and friend. I’m a blogger by hobby, or in other words, I simply blog as a fun hobby. It’s a way for me to try to share some fun, uplifting, inspiring ideas on decorating, entertaining and sometimes outfits. I decided to begin blogging at the urging of friends to share some of my ideas, little did I know there would be a whole new family of friends just waiting for me in this blogging network. Looking forward to meeting some of these incredible blogging friends. Hi, I’m Sue and I love colour and whimsy. I blog at A Colourful Canvas. It’s here that I come to play and get creative with style, sewing, and all things arty and fun. I’m fifty four and delighted to share that wax crayons and glitter glue still make me giddy. Hi! I’m a 57-year old lawyer who appears male on the outside. I’m transgender which explains that incongruity. I blog about women’s fashion, motorcycling and my life’s journey. I started sewing as a child because, like so many others, I had a mother who made wonderful clothes for me. She was highly creative and adept and I was completely inspired by her. I really began my sewing career as a teenager when I started making all my own clothes and have continued this process all my life. I did have a 10-year period when I sewed not a stitch but that didn’t stop me buying fabric! I studied pattern-making in Vancouver in the 60s and then had the opportunity to attend the Helen Lefeaux School of Fashion in the late 80s. Thanks so much for including me in this meetup even though I don’t have a blog. You all inspire me and it will be fun to meet the ladies whose blogs I follow. I luv to sew. Clothes. For myself. Project Minima is into it’s 5th year and began as a way to sort out my accumulation of stuff, especially clothes. I stopped buying them, thrifting or otherwise. I rehabbed and/or mended what I had. And made new things from my stash. Some unexpected things started to evolve. I now have even more clothes! But. They all fit me well, I like them, I feel good in them, and I made them myself. Now I’m ready to change the focus of the blog. Stay tuned. My background is in set design, I have traveled throughout the world designing television commercials and now I live in Seattle where I paint and teach watercolors and I design jewelry. My blog doesn’t have a name yet – hopefully by the time I see you all in July … but it’s about living creatively to inspire happier, healthier and more productive lives. I am a former 1980s fashionista trying to re-discover my personal style in my 40s. Thankfully the big hair, matching scrunchy socks and hip belts are gone. But where do I go from here? My style blog Fashion Forward 40 documents my mis-adventures in fashion as I try to balance my love of fashion with real life, sustainable living, and gravity. Fat Rabbit’s Delight consists of CeCe Witherspoon’s frank, ferocious forays into fashion and food. CeCe is passionate about great food and fun plus-sized fashion (or more properly, ‘fun style’, since style trumps mere fashion every time). CeCe focuses on food and clothes that bring her pleasure. She hopes you’ll like it. 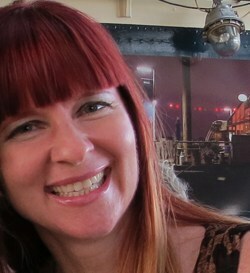 I am the creator of the website 40plusstyle.com which aims to inspire 40+ women to experiment and have fun with style. It’s my full-time business but when I’m not behind the computer, you can find me playing tennis, doing yoga, practicing photography, having fun with friends, travelling to exciting places, relaxing with my family or reading the many amazing blogs I follow. Hi, I’m Tami of Thrift Shop Commando. My favorite past-time is swooping into thrift shops searching for quality and collectible items. I then blog about that, model thrifted ensembles, post current and vintage images, share my sewing projects and generally make mischief. I will be attending the event with my 87 year old mother. I grew up in the Pacific Northwest and look forward to this Vancouver visit. I live in Victoria, BC. Growing up in a small rural community with brothers, I have always been athletic and was usually the tallest, biggest one amongst all the girls at school. I never felt stylish although I always loved fashionable clothes and envied others that wore them. I took a really powerful leadership course years ago and I somehow broke through what was holding me back and gave myself the permission to start dressing in clothing that I was drawn to– big earrings, pencil skirts, tailored tops. I hired a style consultant who gave me some tips and took me out shopping. That opened up a whole new door for me. Next I began searching the internet to find styles that would suit my body type (curvy/pear shape). That’s when I came across a whole world of fashion blogs written by regular (and extraordinary) people from all around the world. I was inspired to share my journey of learning about fashion simply to help even one other person out there that’s been struggling with their looks/body type, perception of themselves. I got connected to a new community of amazing supportive and incredibly stylish and creative people. Its been almost 4 years now and I am super excited to actually meet some of the bloggers I’ve been connected to for the past years but never met in person. I am new to blogging, but very exited at the opportunity to express myself through writing and photography. I hope to to write about a realistic Vancouver lifestyle with a focus on fashion for women in my age group, 50+. I have a warped sense of humor and see beauty all around. Is it wrong to want to capture it, wrangle it to the ground, photograph, and put a “tag” on it? I am looking forward to saying hello to some of the very diversely talented women on Saturday July 25. I write a column that is almost a blog for a local paper, The Island Word. I am a very colorful dresser with a huge interest in self expression. Please count me in to this gathering! A schedule has been established which you should have received via email if you are signed up to the email list. *Please bring one or two items from your own closet (accessories are great too!) that you no longer require for a clothing swap in lieu of gifts. Anyone coming from outside of Canada here is a bit of practical info to help you enjoy your trip to my beautiful country. Weather – First off it will be warm in July. Leave your snow suits at home. Average temperature in Vancouver in July is 22 C or 71 F. Last year it was 30 C 86 F for a number of days, so it can get hot. It can also rain, so bring along a small umbrella. A light jacket in the evening will keep you warm as there is a breeze off of the ocean and it dips down to around 16 C or 61 F at night. ***Air Quality – BC is experiencing a very hot summer this year with lots of forest fires. There is smoke in the air. If you have asthma please keep an eye on the air quality index. Money – The Canadian dollar is currently at .83 US. That means for every US dollar you spend you actually only spend .83 in Canadian! Wohoo! You are all rich! Those of you coming from Europe you’re millionaires in Canada! The Canadian dollar is .70 to the Euro. You will live like Queens here. Make sure to check the exchange rates before you come as they change daily. Customs – Please leave your firearms, exotic pets, home cured meats and hooch at home. Otherwise they will be confiscated at Customs. Those custom’s officials are always looking for supplies for their wild parties. Make sure you have a valid passport. A driver’s license isn’t enough to cross the border from the US to Canada. You can rent a car with a valid driver’s license from the US or Europe. Parking in downtown Vancouver is often expensive. Lodging – We have found a great little gem of a hotel called The Blue Horizon that is centrally located, well priced with good reviews. Greetje and I have already booked our room and will be staying there. Otherwise I recommend both TripAdvisor for hotels (they also offer vacation rentals which are great if you are sharing with a roommate) and Air B&B (which is vacation rentals). You can read reviews, check prices and view the space. Orbitz (US pricing) Expedia.ca (CAD) offers up deals on hotels. Try to book a spot in the downtown core. I strongly suggest you book your lodging early as the same weekend there are several popular festivals including Gay Pride. Please let me know which days you will be attending. Don’t worry if you aren’t 100% sure right now, just a guesstimate will help me better organize the dining. Help us spread the word and grab a button for you own blog!